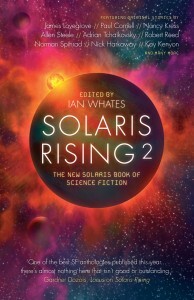 Paul Cornell, Nancy Kress, James Lovegrove and Adrian Tchaikovsky are just some of the top names featured in the brand new science-fiction anthology, Solaris Rising 2. Featuring new short stories from big names in the genre, this latest galaxy-spanning collection of science-fiction from the leader in SF anthologies. Showcasing the finest new science fiction from both celebrated authors and the most exciting of emerging writers, it follows in the footsteps of the critically-acclaimed first volume, editor Ian Whates has once again gathered together a plethora of thrilling and daring talent. From unexplored frontiers to common themes of the genre – alien worlds, time travel, artificial intelligence – this is science-fiction made entirely new in the telling and once again proves why SF continues to be the most innovative, satisfying, and downright exciting genre of all. Next PostNext The Rocky Horror Show at 40!